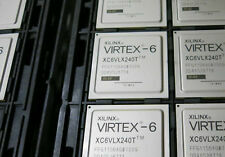 Xilinx VIRTEX-6 IC CHIP. NEW in Tray. FPGA Virtex-6 LXT Family 74496 Cells 40nm (CMOS) Technology 1V 784-Pin FC-BGA (Alt: XC6VLX75T-1FFG784I) Date Code 1113. CRT glass, except for glass with lead content less than 5 parts per million, and clean of phosphor, CRT fines, coatings and frit. THE XILINK PARTS ARE ON BOARDS THAT WERE NEVER USED. IN ORDER TO USE THIS PART IT WILL HAVE TO BE REMOVED AND REBALLED / REFURBISHED. NEW & ORIGINAL . Mounting TypeSurface Mount. Number of Gates1569178. 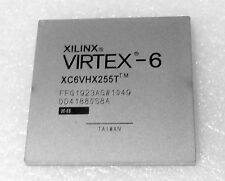 XILLINX XC6VLX75T-2FFG784I Xilinx Virtex - 6. Condition is New. Virtex®-6 FPGAs are available in -3, -2, -1, and -1L speed grades, with -3 having the highest performance. 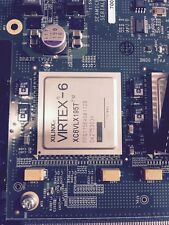 Virtex-6 LXT Series FPGAs: High-Performance Logic with Advanced Serial Connectivity. Refurbished, Matching FPGA HIGH PERFORMANCE Socket Available! Hours of Operation: Monday to Friday 9:00AM to 5:30PM EST. Xilinx Inc. CategoryIntegrated Circuits (IC's). SeriesVirtex II PRO. DatasheetsVirtex-II Pro, Pro X. NEW & ORIGINAL 1 Piece. Number of Gates-. Number of I/O556. Total RAM Bits1622016. (10) NEW XILINX VIRTEX 2.5 V IC FPGA 456 BGA XCV300-6FG456C. THE PRODUCT IS NEW EXCESS MANUFACTURED IN 2000. FPGA Virtex-6 LXT Family 241152 Cells 40nm (CMOS) Technology 1V 1156-Pin FC-BGA (Alt: XC6VLX240T-2FF. ). Xilinx Inc. NEW & ORIGINAL . Mounting TypeSurface Mount. Number of Gates322970. Number of I/O312. Xilinx Inc. NEW & ORIGINAL 1 Piece. Mounting TypeSurface Mount. Number of Gates468252. Number of I/O404. FPGA Virtex-6 LXT Family 74496 Cells 40nm (CMOS) Technology 1V 484-Pin FCBGA (Alt: XC6VLX75T-1FFG484. ). ◆ Manufacturer P/N:1PCS XC6VLX75T-2FF784I FPGA Virtex-6 LXT Family 74496 Cells 40nm (CMOS) Technology 1V 784-Pin FC-BGA - Trays Professional IC chip electronic components XILINX ALTERA Series Model BGA FPGA.